Dentures are prosthetic body parts, just like a prosthetic leg or arm. In this case, it’s a prosthetic mouth. Dentures change your speech, your ability to taste and feel food including food temperature, and your ability to chew, and your appearance. Once teeth have been removed from the jaw bone, your jaw bone starts to recede slowly over time. This means that denture fit worsens over time. Imagine getting a pair of shoes and your feet shrink slowly over time. Guess what’s going to be loose? Do you think you will be chewing, talking, or smiling the same? 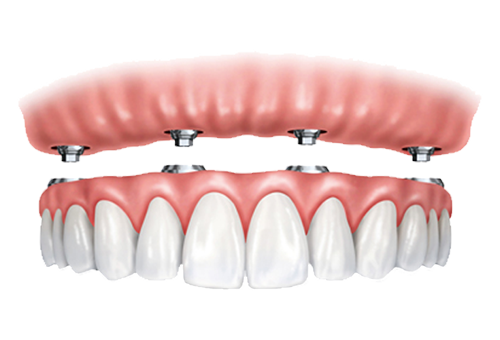 Fortunately with advances in technologies we have excellent options to correct loose fitting dentures to give you a secure smile using dental implants which you can learn about here. Many people don’t address loose dentures because they are uncertain of what they can do and what they may cost. Crossings Dental solves this legitimate concern by providing to you treatment costs up-front. After your initial exam, we can better estimate your denture options and associated costs, with or without insurance. You will not be under any pressure to take on treatment yet when you leave our office you will have in your hands a full understanding of any treatment needs and their costs. Dr. Murasko has over 18 years experience with dentures and all types of bite restoration options.